ATOMIC Squad at Tompkins Square Middle School. SLIME DAY! We're having a STEM Party and you're invited! ATOMIC by Design is thrilled to partner with Tompkins Square Middle School for a second installment of ATOMIC Squad. 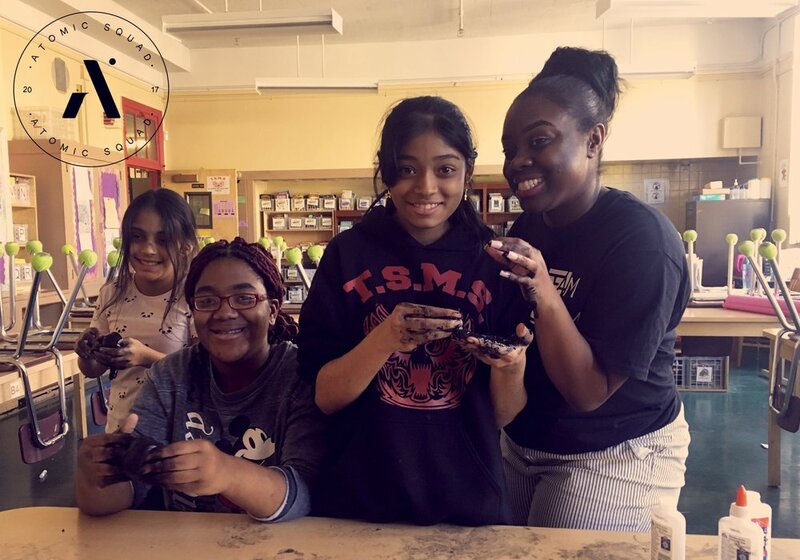 Last year we started a pilot in partnership with Education Alliance and educators at TSMS, and crafted a program that encourages girls grades 6-8 to harness their power and experience the wonder and importance of science and technology. Here are some images of our fun activities. We can't wait to share more soon. The girls strategizing. Maybe sticking the mentos together with gum will result in a bigger reaction? We invited the boys to come make slime with us!